Big Finish has proven time and time again that it’s a company unafraid to experiment with format in its Doctor Who releases, and that has never been on display more than in ‘Doctor Who and the Pirates (Or The Lass Who Lost a Sailor). The title might give an indication that the audience is in for something unique, but the inclusion of a strong musical element certainly sets it apart from any other story. In what seems like a bit of a random prologue until events are explained later in the story, Evelyn visits one of her students at her home and starts telling a tale about time travel and pirates. Evelyn is determined to tell her story even if Sally doesn’t want to hear it, and those disparate feelings make for an intriguing mystery as events are recounted. And while ultimately it is Sally who demands the most focus even though the pirate tale takes up the majority of the running time, Sally is able to be the voice for the listening audience, commenting whenever Evelyn or the Doctor try to influence the story through individual perspective or assumptions. 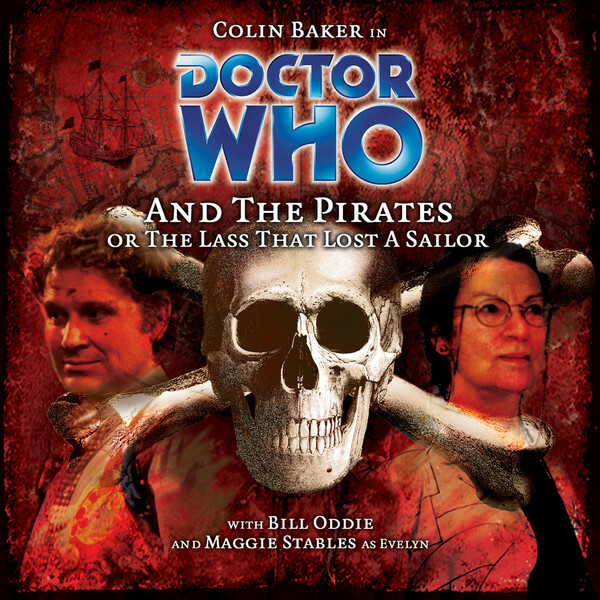 In the recounted tale, the Doctor and Evelyn are in the hold of a pirate ship which has just been attacked by Red Jasper and his crew as they seek knowledge of hidden treasure on the Ruby Islands. There is historical basis to the tale, but the presentation and colourful attributes of the characters (again likely due to the narrators) maintain a sense of uniqueness to events. It becomes clear as Evelyn is telling her version that she is deliberately omitting something that affected her quite profoundly, and though this is eventually revealed, it certainly is a reason for her mildly altering events. The Doctor, on the other hand, is much more forthcoming with events, though even his tale is affected as his propensity for language infiltrates other characters and he himself is portrayed as quite the heroic and dashing figure. Solid performances from Dan Barratt as Jem, Nicholas Pegg as Captain Swann, and Bill Oddie as Red Jasper are particular highlights from the seafaring tale, helping lend an air of credulity to the rather fantastic events. The musical element, of course, has the potential to be the downfall of the piece, and while it will certainly have its supporters and detractors, the musical numbers are included cleverly enough that they do help to develop and move along the plot rather than just being inserted for no discernible reason other than to have a song. Timothy Sutton, the piece’s musical director and composer, deserves a lot of credit for creating a nautical score that adds immensely to the atmosphere. It’s these songs as well that allow Helen Goldwyn as Sally to open up more after suffering through what she sees as a pointless story being told by two people intruding on her privacy. So, as the songs start to take on a more sinister tone as Red Jasper’s true intentions are revealed, the overall plot in the present starts to take on a darker tone as well as Sally’s intentions for her life and the reason that the Doctor and Evelyn are there for her are made clear. Although this is clearly a story about Evelyn and her development, Colin Baker still gets ample opportunity to shine in the later episodes, allowed to showcase both his character’s more callous and ostentatious side as well as his very compassionate and caring side. Maggie Stables as Evelyn, though, proves to be the star of the piece, easily carrying the story as the script demands. Though she is as strong as always in her camaraderie and joking with the Doctor, it’s the more downtrodden scenes where she particularly excels, bringing a sense of foreboding and earnestness to the forefront when she has to recount the tale of Jem the cabin boy and relate it to the distressed Sally. ‘Doctor Who and the Pirates’ deftly balances light-hearted and serious tones, and the memorable performances from everyone involved in both spoken and sung word make for a very enjoyable experience. The compassion of both the Doctor and Evelyn is on full display, and it’s touching to see just how far the Sixth Doctor will go for his companions when needed. This is a format that can’t be attempted too many times without losing its charm, but as a first attempt it’s a tremendous success for the ever-experimenting Big Finish.